AFTER an arduous AFL campaign, many players travel around the world and take advantage of their chance to relax and let loose. St Kilda wingman Ed Phillips did something different. 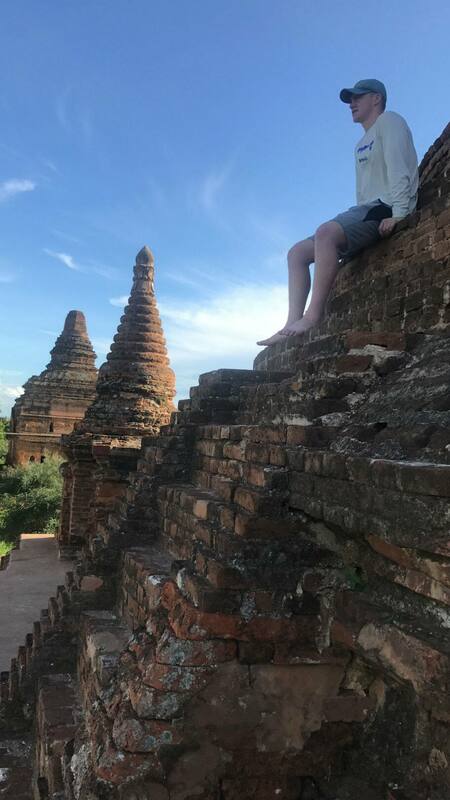 His first season ended and Phillips went to Myanmar and Cambodia with elder brother Tom – who plays for Collingwood – younger sister Lucy, and parents Anthony and Liz, for sightseeing and volunteer work. He and Tom returned for their respective best and fairest awards, which were both on October 6, before the pair jetted out to India and Nepal with Anthony for three weeks. Through their family's organisation, The Phillips Foundation, they helped disadvantaged people have a chance to receive an education, by doing things such as providing books and other necessary items. It's an area very important to Phillips and his family. Anthony and Liz are teachers and encourage their children to be curious. "My brother, my sister and I have all developed a want to help out and give back to the community, because we've been so fortunate ourselves," Phillips told AFL.com.au. In Nepal, they helped an organisation called Seven Women. It helps females overcome gender inequality by teaching basic skills and how to earn an income. Pushing himself out of his comfort zone holds appeal for Phillips, who has yet to play a senior game after being drafted at No.56 in 2016. "I quite like going to places where sometimes you might feel a little uncomfortable or unsure, but that just makes for great stories, and memories when you come back into this very comfortable life we've got," Phillips said. "That's why I love it. It's more of an adventure and you learn so much, I found, from going to different parts of the world and experiencing different cultures." The 19-year-old fine-tuned his foot skills with brother Tom overseas, much to the amusement of the locals. "We took a couple of footies over and got a fair few strange looks from people over there, asking 'Is that rugby?' or 'Is that basketball?'. We just went 'No, it's hard to explain, we'll show you'," Phillips said. "We'd kick it around and their eyes would light up." He managed to fit in his running, despite some hurdles when on the roads, having to weave his way through cars and cows. However, that training wasn't enough to win the time trial, with captain Jarryn Geary edging out Phillips by a few seconds in December's 3km race. The elite runner has impressed this pre-season after taking heed of the lessons he learned while sidelined for seven weeks with a left ankle syndesmosis injury suffered while playing VFL against Coburg in May. "You probably take it for granted at times, just being able to run around and participate in every training session and every weights session," Phillips said. "It was probably a wake-up call to me, that once you're injured, footy's your job, it's hard to get better from there, because you're not actually out on the park."